When I was chatting with Christy and Bonnie on the Fountains of Carrots podcast recently, I realized that while we have some set traditions for observing Lent in our home, we haven’t developed as much for celebrating Eastertide (50 days!) after Easter Sunday comes to an end. But we’re slowly and surely adding in some solid Easter traditions in our home, so I thought I’d share. The Easter Vigil in particular is a stunning experience. I mean, there’s a bowl of fire! To prepare them for the Mass and emphasizing the importance of what we were celebrating we bring out a new outfit for each of the kids to wear to the Vigil. Last year, some items were purchased new and some where new-to-them hand-me-downs. Benjamin got new pants and a white shirt and tie, Lucy and Gwen wore fancy dresses. I showed them all their new clothes during Holy Week and talked about how we dress up especially nice on this wonderful day. When we got home from Mass (it’s a LONG Mass) they got to open their Easter baskets (last year I shared about what sort of things we put in ’em), have one sweet treat, and then it was off to bed knowing they could play with their new toys Sunday morning. We had a big breakfast and then spent the day with extended family after their Easter Sunday services. We replace the Lent decor with Easter decor on Easter Sunday. Since we gather around the table so frequently (and since we don’t have a mantle because Florida…not much need for a fireplace) the dining room is where we put our liturgical flare. And since I’m candle-obsessed, we use these adorable Easter Egg Votives from Toadily Handmade Beeswax Candles to brighten up the table. Each of the kids gets one in his/her Easter basket (huge hit last year!) and then they get so excited about lighting them at the table! I also go a little nuts with flowers around the house. Decor is pretty sparse during Lent, so the kids notice the change! We try not to go crazy with sweets, but we do loosen things up in the treat department to celebrate. We say “yes” more often when the kids ask about making ice cream or going somewhere fun. The quiet Lent is past and the party begins! This year, we’re going to listen to the new Easter at Ephesus album and enjoy some of these Easter picture books, too! Why not save some of the fun Easter-y activities for the Eastertide? For example, we don’t usually jump in with our parish Easter Egg Hunt because it’s always on Palm Sunday and I really don’t like starting to celebrate Easter before we’ve even gone through Holy Week. So, we do our own little egg hunt on Easter Sunday with family. But wouldn’t that be a great activity to do with friends during Eastertide to keep the party going! 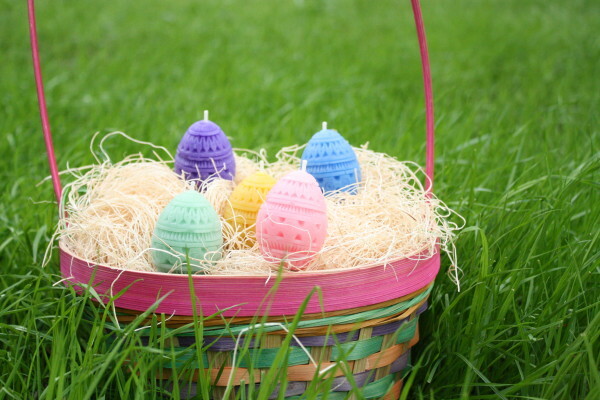 Win your own set of six of the beautiful Easter Egg Votives (in a cute egg carton with colored Easter grass, wrapped with cello and tied with a ribbon!) OR this gorgeous honeycomb pillar from Toadily Handmade Beeswax Candles (your choice). The honeycomb pillar is decorating my kitchen window right now and I can’t bear to light it yet, because it’s just soooo pretty. What special Easter traditions do you have get the Eastertide party going? This post is sponsored by Toadily Handmade Beeswax Candles. Review and giveaway products were provided by Toadily Handmade Beeswax Candles. All opinions are my own and I only share about products I love. The egg candles are so pretty! They are definitely my favourite….and I’m off to pin and Facebook them….!! I love TH’s products. I get their advent beeswax kits for Advent and there easter candles are so dear! Pinned and posted. Took a look at the site, too. I’d have to say for my favorite it’s a toss up between the sushi candles (sushi?!) and… basically any of the floating ones. Really lovely candles! I posted on Facebook, and pinned an image. I love the Easter egg candles for the season, but otherwise, the pillars are gorgeous and burn so well! Love the egg candles! Have always wanted a set! I visited the website. I like the floating bee candle. And I love the Beeswax Tea Lights, so hard to find and usually to expensive for local apiaries to make. Let’s keep this beeswax revolution rolling so the demand is high enough for it to be worth it for them! I like the sunflower candle! It is hard to pick a favorite from their site, but the candle making kits look like such a fun activity for the kids! How fun would the small candles be for birthdays? And my favorite still is the different colored sheets for personalized rolling! We have some at our house! I visited the website and pinned to Pinterest! I love the little beehives, but all the colors of the eggs are beautiful! It’s hard to pick a favorite off their website, but I think the honeycomb pillar candle is awesome. And, I’d love to try out one of the candle making kits! I think the make your own candle kit looks like fun. We love Easter Vigil and have been taking our son (6) for the last few years as well. The excitement and joy in the church is so palpable on that night. I pinned the sweet egg votives to one of my boards! I shared the egg votives on my Facebook timeline! By far my all time favorite product from the website where the sushi votive candles! Ha ha ha imaginations are awesome! I pinned the egg candles! Would love to have one for next year, when my baby girl will be old enough to appreciate it. I really like the advent candles…but would love to try some of the solid pillars too. Pinned it! 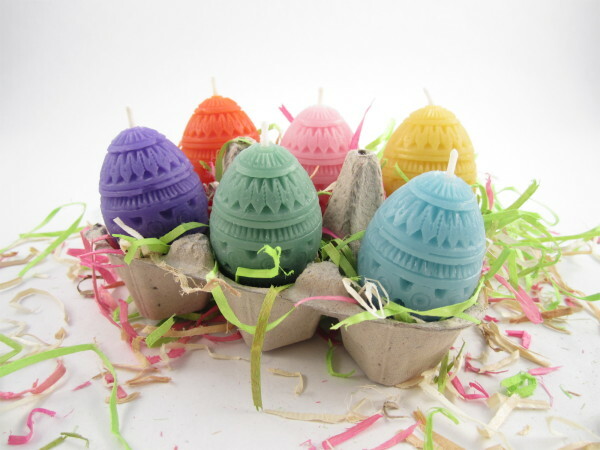 The site is great, I love these little egg votives! Love these! Shared on FB. Pinned to my Easter board. Love the leaf pillar candles! Those are lovely! Pinned! They’re so gorgeous… I don’t think I could ever burn them. Visited the site; the beeswax hive candle is too stinkin’ cute. I pinned the Easter egg candles from Toadily Handmade onto my “Easter” Pinterest board. My favorite product on Toadily Handmade’s website is their floating candle in the shape of a frog on a lily pad – so cute! I pinned the Easter votives!! They’re adorable. Visited the main website…so had to pick a fave!! I’d probably love the honeycomb solid pillar, though I too would be loathe to actually light it and see it burn away! I pinned the egg candles. So cute! Love the floating candle disks — so many beautiful colors! I’ve got a love for fat, big candles so I would love to buy the 4′ pillar off their site. Pinned the Easter egg candles! So cute! I’m so boring, my favorites are just the hand rolled pillars – nothing fancy! I’ve noticed that I’ve recently been really sensitive to the smells in other candles, so we’ve been trying to do away with those and to beeswax instead (and we’ve gotten all our beeswax candles from Toadily in the past). I pinned the Easter votives– so great. As for a favorite product, I’ve been meaning to make the Advent candles you post about, but always end up forgetting until after Advent starts– in browsing their site, I love the small candlemaking kit, which I think I need to pick up to get some practice in before next Advent! Also, I know this is a giveaway post so you may not be responding to comments, but I’m curious to know why your parish does the egg hunt on Palm Sunday– even as an Anglican, I would be thrown by celebrating Easter before Holy Week! Oh! I have been dying for a Toadily Beeswax product for ages. I really like the Christmas Ornament Solid Pillar: http://www.toadilyhandmadebeeswaxcandles.com/christmas-ornament-solid-beeswax-pillar-candle/ But I wish it came in red or green! Yay! I love the giveaway posts from toadily handmade! I pinned again this giveaway! AND, I looove the taper candles. So handy! My faves off the website are the pillars, and of course the advent candle set. I got the set of 3 last year and am using some of the leftovers for Lent!! I really love the two things you’re giving away! I really love anything to do with bees, and the honeycomb pillar is gorgeous! But the Easter eggs would be perfect PERFECT Easter decor! I visited the website and love the handrolled tapers! I think I would like the natural scent since it smells like honey! I pinned the votives! They are so fun! I likes the FB page! Oh my goodness! The sushi candles! But I would probably just choose the basic and beautiful solid poured pillars or tea lights if I was going to buy any…boring but true. Tough to choose a favorite, but I think it’s the honeycomb pillar! I pinned those adorable egg candles! 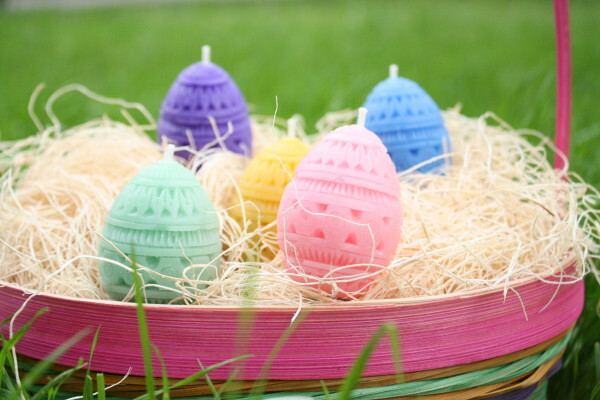 I think the egg votives are so cheery- definitely a great choice for Easter decor, and I also lovethe taper candles on the Toadily Homemade site. Thank you, Haley! I always enjoy reading your blog. I thought the candle making kits were great! Hope I win the give-away! I love those Easter egg votives (thanks for the chance to win them!! ), and I also love the tulip votives as well! I have bought advent candles from them, but the basket weave pillar candle is divine! Ooooo…so hard to pick a favorite! I do like the pastel votives! I really like the hand rolled pillars! I pinned the Easter egg candles. So cute! I love all the solid pillars, but I think the basketweave is my favorite. Love the Easter egg candles! I love the basketweave pillar! I really like the beeswax beehive votive candle. It’s just soo cute! So many lovely things – but the sushi candles are crazy cute. And I thought my answer was going to be the Easter egg candles, but then I discovered the sushi ones! WHAT SO CUTE! Pinned to my “Ideas for Easter” board! I’m in love with the set of rosebud beeswax votive candles! Pinned the egg votives! My boys each got one in their baskets last year per your recommendation, and I love them! Although I love everything on their site, I think I love the honeycomb pillar best! I pinned the Easter votive candles. I really like the little Easter egg candles! I pinned the Easter egg candles! Also, I love the pillar candle from the website! ok i have NO idea what i would use them for but those sushi candles are too much! I am obsessing over the eggs!! They are just the cutest! We’re a new family and I’m trying to create traditions 🙂 I think a candle in our baskets is a great one to add ! I love the eggs…they are so cute and colourful! We bought the advent candle-making kit this past Christmas and loved it — will for sure be an annual purchase!! Simple enough for small hands and beautiful too. We really loved the Advent candle set we got last year. Thanks for the giveaway! Lovely candles! Would love some! And I love all the colors of the hand-rolled taper candles! Beautiful! Thanks for the giveaway. I pinnned! I would share on my FB but gave it up for Lent! I love the rose tealight candles (and the frog ones). It is hard to pick 1 favorite! I love everything they make, but I think the eggs are my favorite. I told myself I should wait and see if I might end up the lucky winner here, but even if I don’t win the eggs I might buy one for my husband’s Easter basket anyways. I’m so excited to start our own family traditions (even though we don’t have kids yet)! I think all of the floating candles are just so adorable. I can’t pick a favorite one! The Easter egg candles are so pretty! I think they’re my favorite. The votive candles are so sweet! http://www.toadilyhandmadebeeswaxcandles.com/easter-egg-beeswax-votive-candle/? The rose tea lights are adorable! The tulip and rose votives are pretty. They’re perfect for spring! Pinned to my “Domestic Church” board! The candle making sets are such a good idea. I’m as un-crafty as they come, but those look manageable. I think they’re my favorite. Although it’s hard to beat the cuteness of the egg votives! How to pick a favorite beeswax candle?! I love the sculpted votives best, I think. My favorite item is the CHRISTMAS ORNAMENT SOLID BEESWAX PILLAR CANDLE. My favorite item is the solid beeswax honeycomb pillar. What a beautiful candle! Hi Haley! I’m one of the 3 people left on the planet not on facebook or pinterest! Hope I can still be counted! I love the egg candles, they are so sweet! Thanks for sharing your ideas about celebrating Eastertide. I love their Advent candles. I found them from your website a couple of years ago, thank you! Those egg ones are adorable, I totally need those in my life! I love the egg votives, but the pillars are great too! I pinned and shared on Facebook! 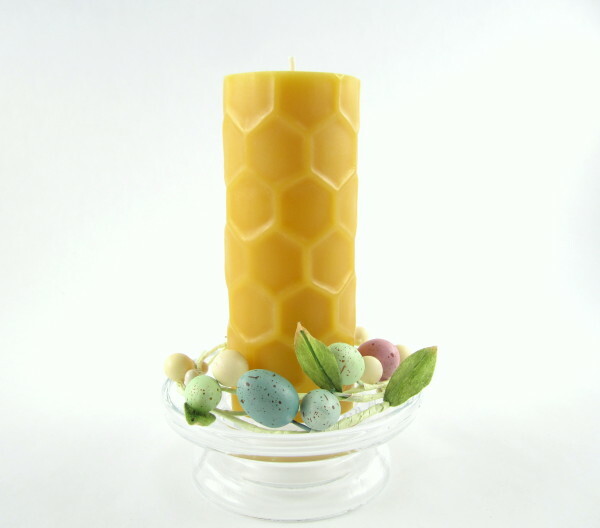 I also checked out the website and I have to say my favourite is tied between the votive beehive candles and the Easter egg candles. both are super cute! Pinned those Easteg egg votives! Shared those gorgeous votives on Facebook! You know I love the carved rose pillar candles, but the homeycomb pillar candle is actually another one of my favorites. Can’t have just one favorite, they have too many awesome candles!